Gilmour greenlawn Sprayer is a translucent tank for checking chemical level.Three-way pressure relief valve prevents over-pressurizing and provides easy release of pressure when job is finished. Yellow band indicates full working pressure. Special polymer construction for chemical resistance and durability. Large tank opening for convenient filling and cleaning. 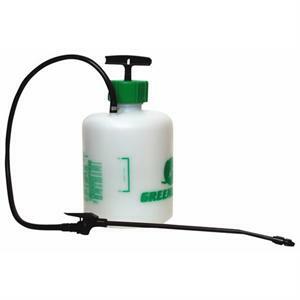 Easy to use Greenlawn Poly Sprayers feature a thumb control valve and a wand storage clip in the handle. The Greenlawn Sprayers Translucent tank makes it easy to check the chemical level so you can be sure you never run out in the middle of a job. You can use your Greenlawn Sprayers to spray insecticides, herbicides, fertilizers or just to water your plants. Maintain a healthy lawn and garden using the Gilmour Lawn and Garden Sprayer. This versatile sprayer holds one and a half gallons of water, insecticide, liquid fertilizer, or weed killer. The unit features a specialized port for the attached hose and included wand. The nozzle is also adjustable from a fine mist to a coarse spray for more versatility. The translucent plastic tank will keep fluid levels visible while spraying. The unit is also lightweight, for ease in moving it around the garden. Use the included stickers to clearly indicate the intended use of this sprayer. 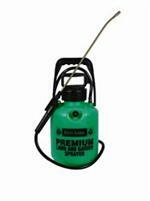 Keep your lawn and garden healthy and beautiful with the Lawn and Garden Sprayer. Made in the USA.